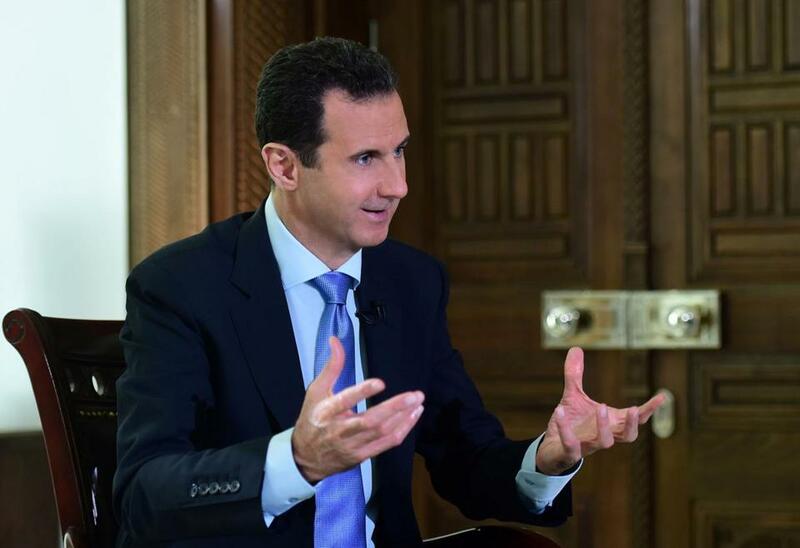 In an interview with the Portuguese broadcaster RTP published Tuesday, President Bashar Assad of Syria welcomed the prospect that Trump would make good on his campaign promise to focus exclusively on fighting the Islamic State. WASHINGTON — President Bashar Assad of Syria, condemned by the Obama administration and much of the West for waging a brutal war of suppression against Islamist opponents in his country, said this week that President-elect Donald Trump could be a “natural ally” in the fight against terrorism. The comment underscored the degree to which the new administration’s approach could reverse central tenets of US foreign policy. In an interview with the Portuguese broadcaster RTP published Tuesday, Assad — whom President Obama wants removed from office — welcomed the prospect that Trump would make good on his campaign promise to focus exclusively on fighting the Islamic State and to align the United States with Russia, a close ally of Assad’s, in doing so. The Islamic State is one of an array of moderate and extremist groups seeking to topple Assad. Assad’s statements — a remarkable shift in tone from a leader who Secretary of State John Kerry has said should be investigated for war crimes along with Russia — highlighted the complexity of the foreign policy challenges awaiting Trump and the extent to which he has signaled a break from Obama’s approach, especially in the Middle East. In Syria, Trump will inherit an especially tangled set of alliances and trade-offs, a situation that has bedeviled Obama in a region currently the site of US military action in support of efforts to contain or destroy the Islamic State. His comments, while cautious, were the latest evidence of a growing expectation among both opponents and allies of the United States’ that Trump will reverse Obama’s policy on Assad, which lays much of the blame for the Syrian civil war at his feet. A European diplomat said Wednesday that officials in Germany and Britain are bracing for a US about-face on Assad, and Arab diplomats expressed a similar worry. In an interview last week with The Wall Street Journal, Trump signaled as much, suggesting that once he took office he would drop US support for certain Syrian opposition groups that have been fighting both the Islamic State and the Assad government, and focus solely on bombing the Islamic State. “My attitude was you’re fighting Syria, Syria is fighting ISIS, and you have to get rid of ISIS,” Trump said, using an acronym for the Islamic State. But foreign policy experts, both Republican and Democratic, say such a move will probably leave the new president with a very different problem: deciding how to finesse the battleground of the Syrian civil war — which will still be going on — without putting back in place all of the factors that led to the rise of the Islamic State in the first place. The Islamic State is in retreat regardless of Trump. The US-backed campaign to retake the last Islamic State stronghold in Iraq — the city of Mosul — is well underway. In Syria, the US-led coalition has been gaining ground on the Islamic State’s stronghold of Raqqa. While Raqqa may not be retaken by Jan. 20 when Trump is sworn in, Pentagon officials say that Mosul probably will be, and that Raqqa could fall not long after. But the battleground defeat of the Islamic State is almost the easy part. Trump’s administration will then have to confront hard choices on the other war in Syria, namely balancing the competing forces of traditional US opponents — Syria, Russia, and Iran — with traditional American allies. These include Turkey, a NATO ally, and the Sunni Arab countries, like Saudi Arabia and the United Arab Emirates, who want to arm and bolster groups opposed to the Syrian government. Assad, Russia, and Iran are not just fighting the Islamic State. They are also fighting any Syrian groups opposed to the government, including ones backed by the United States and the Sunni Arab countries. If Trump abandons that alliance for the Russia-Syria-Iran axis, he will effectively be strengthening Assad’s government. That is the same government whose repressive, anti-Sunni policies are blamed by US, European, and Arab governments for fueling the rise of the Islamic State and other extremist groups to begin with.